Through the winter, there are chickadees that hang out in my backyard. On Sunday afternoon, I found a few of them pecking seeds out of the fresh snow below the feeder. I took a few minutes to photograph them when the sun had dropped low enough to backlight them and the speckles of snow their pecking threw into the air. A boreal chickadee came at the last and flitted about for a few seconds before flying off in a spray of glistening snow. In front of the patio to the front door of my house there is a stump where the previous owners had cut down what must have been a large tree. Aside from the occasional decoration, this trunk remains largely unused by us. However, we all like it so there it stays. 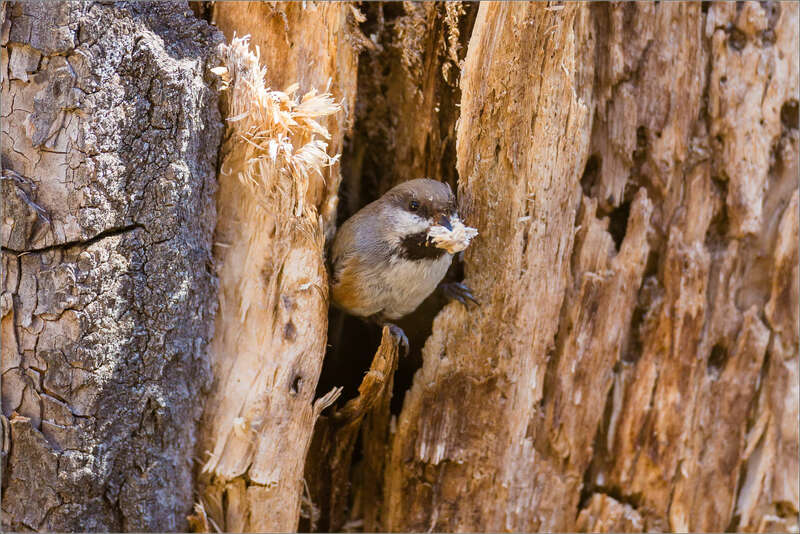 Now, I understand why… today a pair of Boreal Chickadees started to dig out their hollow to make their nest. They carried out small clumps of wood pulp clawed out on every trip. I hope they choose to stay here.